This past Saturday we attended our first cubmobile derby. It was not a competion so we did not have to follow the " blueprint" exactly, we just needed to be around the same size. 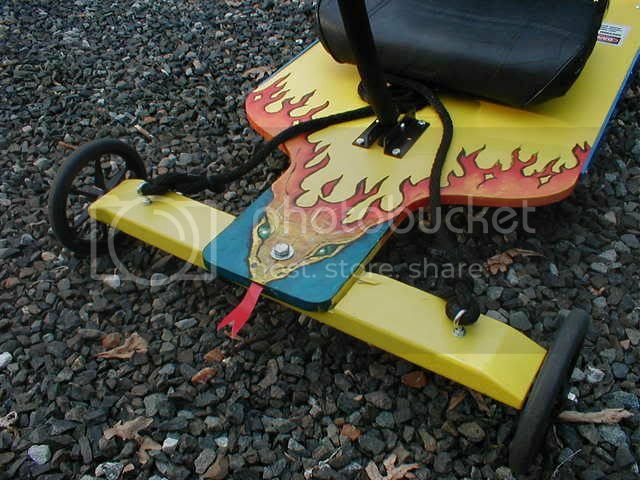 2) Adjustable seat, we had a 7year old boy drive as well as a 12 year old girl. 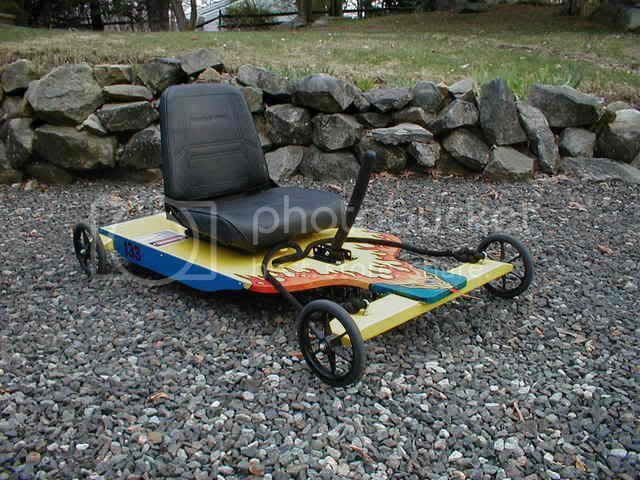 3) 3/4" Plywood body made it very easy to mount the seat. 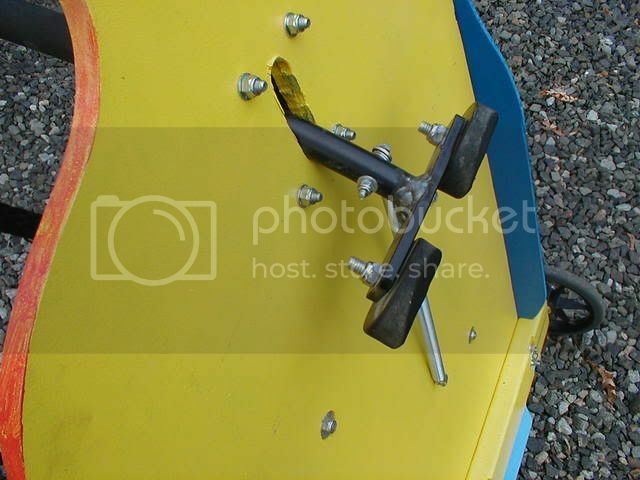 4) Instead of trying to cut a piece of tire for the brake, I had my son drill 2 hockey pucks and we bolted them on. They worked GREAT and I think that everyone that saw them and how well they worked will be using them next year. 5) Mount the steering stop blocks very close to the center board! Ours were 3/16 off the center board and worked well. 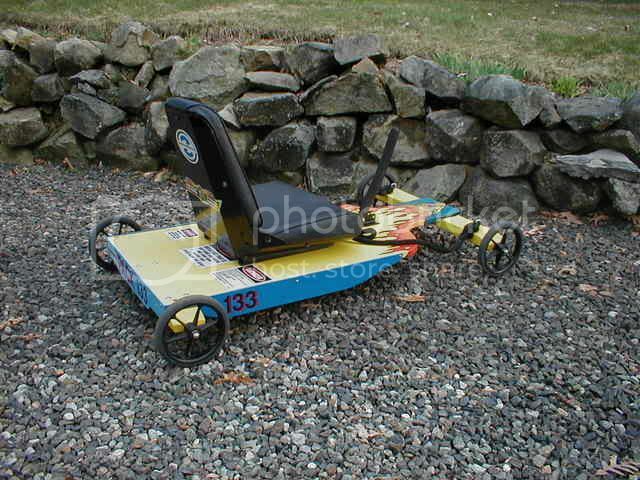 The cubmobiles that had tha stop blocks 3 inches off the center boards were getting upside down from oversteering on the hill! ....SCARY. 6) Lastly my son and I had all the parts premeasured so that when the scouts came over to build the car ( 2 days before the event) the project moved right along and the keep the boys interest. Hay great pictures, Thats one way cool cubmobile. I liked the pictures of the axle and brake. Im hoping to have mine done this week sometime, ill add more pictures of it later. How did the comtech wheels fair ? i got the 10 inch ones, was wondering. The Comtech wheels worked great. 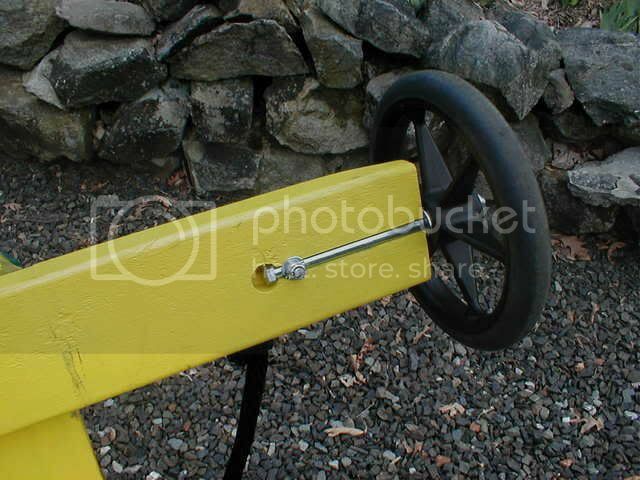 Out of 25 cubmobiles 2 had these wheels, ours with the 8" and the other fast one had the 10". After about 25 runs on rough surface, and one where it was pitched sideways at full speed with our biggest driver where I thought the tire would come off the rim they are pretty well scuffed but in good shape. We got more then our moneys worth from these wheels. The brake in the offical specs doesnt work that well.